Make your own version of this super healthy breakfast option! 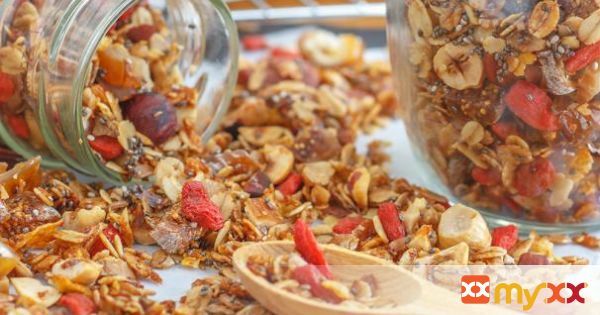 Once you try it you won’t go back to the shop-bought granola! 1. Preheat the oven to 160°C/320°F. 2. Melt the coconut oil (if not in liquid form). Roughly chop the almonds, hazelnuts, dates and figs. 3. In a large bowl combine the oats, coconut, hazelnuts and almonds with coconut oil and honey. 4. Transfer the mixture onto a baking tray lined with baking paper. Bake in a preheated oven for 15-20 minutes. Stir occasionally to get nice golden brown color. 5 minutes before end spread chia seeds around and give it one last stir. 5. When ready, let it cool. Keep in an airtight container. 6. Enjoy with yogurt, fruit or milk!